In the new millennium, the challenges met by the present day farmers are quite different from those met by their predecessors. The enormous pressure upon the farmers, specially small and marginal to grow more food on less land. This has made them information hungry. Now a days, a sound knowledge base is as critical input in agriculture for them as are the other inputs such as seed, fertilizer and water. Under such circumstance, the role of extension education assumes a new significance. Dr. Rajendra Prasad Central Agricultural University through Directorate of Extension Education is effectively playing this role.This Directorate was established in the year 1977 as a statutory wing of the University. Prior to this, the extension activities were controlled by the State Government. The objective behind creation of this Directorate was to establish a close linkage between the technology generation and technology dissemination units and establish linkages between State Department of Agriculture, University, ICAR and other Institutes. Promotion of agricultural development through professional extension services. Strengthening and enhancing of professionalism in extension. Supervision and monitoring of extension programmes. Providing guidelines and maintaining coordination among various centres including KVKs. Organizing training for extension functionaries of State Govt. and Central Govt. Officials to upgrade their knowledge base. Training for field functionaries, farmers, unemployed youths, housewives and others are organized at two levels, at the University level and at KVK. The University level trainings are organized at it’s headquarter and other campuses of the University mainly to the field functionaries and subject matter specialists for updating the scientific knowledge and to improve the technical skill of the officers of different state line departments and NGOs. Training programmes for farmers/farmwomen and unemployed rural youth are mainly organized at all KrishiVigyanKendras on a routine basis. Primarily, trainings are intended to address problems of under-employment, unemployment and malnutrition in rural areas through diversification of agriculture andpromotion of horticulture, fisheries, dairy, livestock, poultry, beekeeping, sericulture, etc. Support to agricultural extension is carried out mainly through organization of State/district level Kisan Melas; publication of Kisan Diary; publication of Book/Booklets/Folders/Leaflets/Pamphlets/Radio/T.V. talks etc. In many areas, low agricultural productivity is an outcome of a lack of awareness. The university publications are to make the growers well acquainted with the latest production technologies. The University publishes every year Adhunik Kisan Diary. This diary contains information related to agro-climatic conditions prevailing in the state including the soil situation. The packages of practices related to various crops, the cultivation of which are possible in these agro-climatic conditions are also included in the dairy. University also publishes a monthly magazine in Hindi which is named Adhunik Kisan Patrica. It includes the relevant articles pertaining to the crop season. In addition to this, a number of bulletins and folders on package of practices of crops, livestock production, fish culture, bee keeping, mushroom cultivation, poultry etc are also published on regular basis. The RPCAU annual report is brought out to provide the latest information on activities of the colleges, research centers and KVKs. The farm Advisory services comprises of scientists visits to villages, farmers visit to research station and replies to farmers queries through postal correspondence. Agromet Advisory Services Project (Dept. of Science & Technology, Govt. of India) has achieved success in creating awareness among the farmers about the importance of weather in agricultural decision making. Meteorological data recorded at Pusa Agromet Observatory are sent to Mausam Bhawan on regular basis. On every Tuesday and Friday medium range weather forecast from National Center for Medium Range Weather Forecasting, Noida are received and in anticipation of weather forecasts, Agromet Advisory bulletins are prepared on the recommendation from various subject matter specialists/scientists of the university. These advisory bulletins are then sent to the farming community through mass media, KVKs & through personal contacts for their day-to-day agricultural decision making. Feedbacks are collected from farmers for economic impact analysis and to know from them how much economic benefit they get by following our weather forecast based agro-met advisory. Verification and reliability of forecast using actual weather observations of local agromet observatory are carried out on seasonal basis and are reported to National Center for Medium Range Weather Forecasting, Noida. Besides, weather reports particularly during inclement weather situation are prepared to meet the needs of media and other agencies. The establishment of Agricultural Technology Information Center (ATIC) has provided a mechanism beyond individual units of research institution in contributing towards the dissemination of information. This has served as a single window system with an objective to help the farmers and other stakeholders both to provide solutions to their problems and make available all technological information along with technology products for their transfer and use. Through this center, the Directorate is serving farming community by providing the most important input i.e. knowledge input along with other inputs such as seeds of different high yielding varieties of various crops, graft & gooties of horticultural crops, fertilizers and publications of the University. In an information age, the role of appropriate information package and its dissemination assumes a portal role. It is not only important to generate information but also to see that the required information are delivered to the end users at the earliest and that too without any dissemination loss. Krishi Vigyan Kendra is a front line extension system and a lighthouse for the farming community in remote areas of the district fulfilling this need. It works upon the principles of learning by doing and seeing is believing. 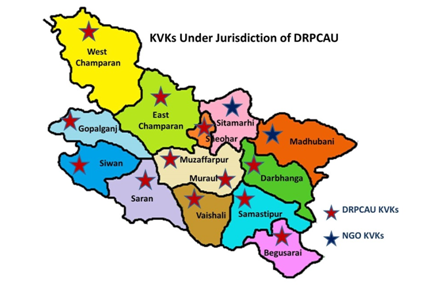 KVKs under the technical control of RPCAU. The mandate of KVK is Assessment & Refinement of new technologies and Demonstration of proven technologies for Application and Capacity Building. Production of quality seed and planting material for the district. 1. Innovative farmers from thirteen districts under our university jurisdiction from Bihar have been felicitated on 26th January, 2018 with Innovative Farmers Award-2017. 2. KVK Saraiya, Muzaffarpur, was given the best KVK award -2017 on 26th January, 2018. 3. Dr. R.K. Tiwari received Young Scientist Award during The National Conference “Improving Income of Farmers through Agriculture and Aquaculture through Development Interventions” which was jointly organized by Society of Krishi Vigyan, Punjab, Association of Aqua culturists and ICAR-Central Institute of Freshwater Aquaculture from 5-7 January, 2018. 5. DRPCAU,Pusa got best stall prize during closing ceremony of three days state level agriculture fair in Motihari on 15 April, 2018.